Minoxidil is an antihypertensive direct vasodilator that can cause severe toxicity when sufficiently ingested. We report a case of accidental ingestion of 5 ml topical minoxidil solution 5% presented with chest pain and new-onset ST depressions. After giving IV saline and performing echocardiography/angiography, the patient fully recovered without any pharmacotherapy such as vasopressors and discharged 4 days after admission. The clinical toxicology, treatment, and previous case reports of minoxidil poisoning have been reviewed. The 61-year-old patient referred to the medical toxicology department of Noor Hospital in Isfahan on December 23, 2017. The patient accidentally ingested about 5 ml of local 5% solution of minoxidil 5 h before admission. He presented to the emergency department with severe chest pain. He had a medical history of uncontrolled hypertension managed with 25 mg losartan daily, and medical history was negative for other drugs and diseases. Initial vital signs included a blood pressure of 80/55 mmHg and a pulse of 85/min. The patient was alert and to some extent, agitated. Head, neck, chest, abdomen, and extremities were normal without any pathologic finding. The patient was given a dose of 50 g activated charcoal with 30 ml magnesium hydroxide. The systolic blood pressure improved to about 110 mmHg, in response to parenteral fluid infusion with dextrose-saline solution. 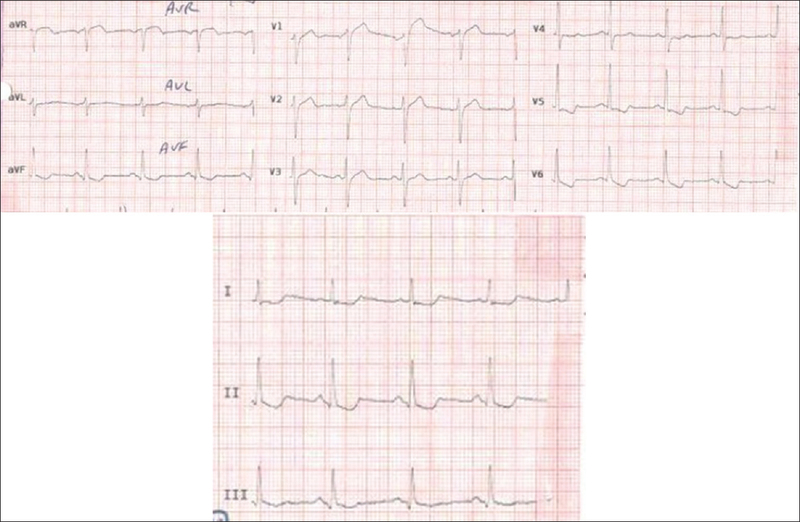 A 12-lead ECG was recorded and showed new-onset ST depressions was seen in II, III, aVF, V5, V6, and ST elevation in aVR, V1, and V2 [Figure 1]. The patient was given isotonic IV fluid. Troponin-I on presentation was 0.15 ng/mL and 6 h later was 0.17 ng/mL (normal, 0.03 ng/mL). Since the echocardiogram showed preserved ventricular function with an ejection fraction of 60% structural heart disease was ruled out. He was placed under coronary angiography. The angiography report was as follow: left anterior descending: NO significant lesion-left circumflex: patent-right coronary artery: patent-minimal vessel disease-recommend: Medical follow-up. The patient fully recovered with stable blood pressure, normal (ECG), and mild residual tachycardia [Figure 2]. The patient discharged 4 days after admission. Only a few cases of minoxidil intoxication in humans have been described in the literature. This is the first case of topical minoxidil solution ingestion-induced EKG changes were resolving spontaneously without intervention in our center. Minoxidil is well absorbed from the gastrointestinal tract, and peak serum concentrations are seen within 1 h of administration. Minoxidil must be metabolized by hepatic sulfotransferase to the active molecule, minoxidil NO sulfate. Minoxidil sulfate activates the ATP-modulated K+ channel. By opening K+ channels in smooth muscle and thereby permitting K+ efflux, it causes hyperpolarization and relaxation of smooth muscle. Like hydralazine, minoxidil dilates arterioles but not veins. Maximal hypotensive effects may be delayed due to the delayed in the formation of the active metabolite. Minoxidil has a plasma t1/2 of 3–4 h, but its duration of action is 24 h or occasionally even longer. It has been proposed that the persistence of minoxidil in vascular smooth muscle is responsible for this discrepancy. The cardiac consequences of the baroreceptor-mediated activation of the sympathetic nervous system during minoxidil therapy are an increase in heart rate, myocardial contractility, and myocardial O2 consumption. Thus, myocardial ischemia can be induced by minoxidil in patients with coronary artery disease. In our case, the patient ingested 5 mL of the 5% solution, equaling 250 mg minoxidil, which is approximately 6–25 times greater than the recommended therapeutic oral dose for controlling hypertension (10–40 mg daily dose for adults). The initial daily dose of minoxidil may be as little as 1.25 mg, which can be increased gradually to 40 mg in one or two daily doses. Poff and Rose reported a 20-year-old female that ingested an unknown quantity of minoxidil tablets and presented with tachycardia, diffuse T-wave inversion and S-T segment depression on the ECG and labile hypotension. 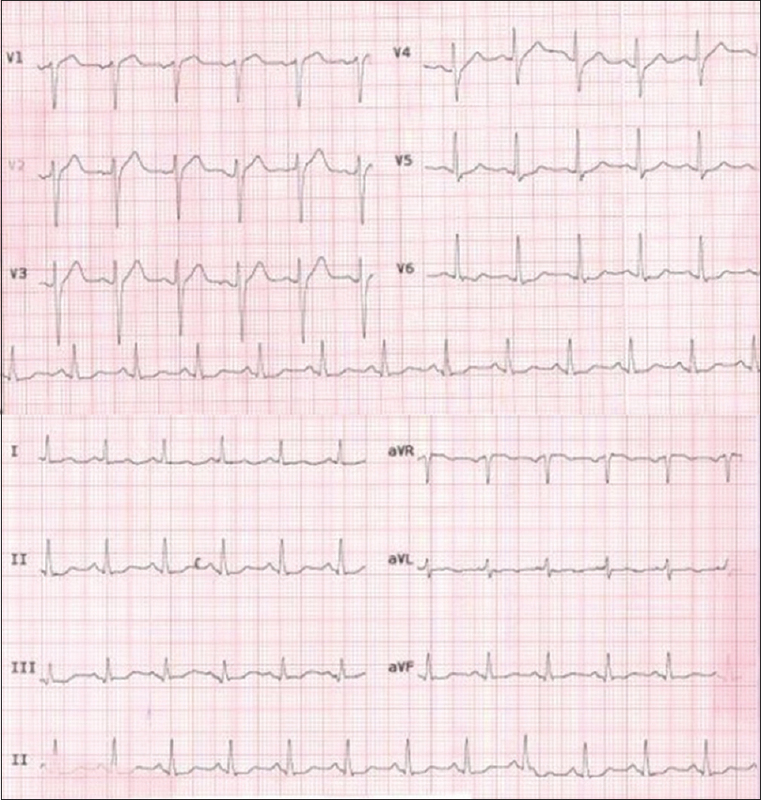 The ECG symptoms of this patient were similar to our case. In our patient, ECG changes were seen in the form of ST Depression, and T-wave inversion in inferolateral leads and ST elevation in anterior leads. Flattened and inverted T waves frequently are observed in the ECG following the initiation of minoxidil treatment. These are not ischemic in origin and are seen with other drugs that activate K+ channels. Isles et al. reported a 2-year-old boy allegedly ingested 100 mg minoxidil tablets 1 h before presentation at an emergency department. Emesis and lavage were the only treatments provided. He was observed until 13 h after the ingestion; the only symptom he developed was a tachycardia of 160 beats/min. The plasma half-life of minoxidil is about 4.2 h although the hemodynamic effect may persist for up to 75 h, presumably due to accumulation at its site of action. Considering that minoxidil has a large volume of distribution (mean of 197 L in healthy controls), persistent effects at the site of action, such as in the smooth muscles, may lead to the effects. In our case, symptoms prolonged for 4 days. In other studies, the symptoms of patients lasted several days.,,, As seen in our case, minoxidil may aggravate or uncover angina pectoris. The measurement of serum levels of minoxidil would strengthen our report, but minoxidil is not detectable in the routinely performed toxic screen analysis in our country. Our case showed that ingestion of large amounts of a topical minoxidil solution can lead to prolonged cardiovascular symptoms and supportive treatment may be sufficient for treatment in some cases. Farzad Gheshlaghi, Shafeajafar Zoofaghari, and Gholamali Dorooshi contributed for the idea and design of the study. Shafeajafar Zoofaghari, and Gholamali Dorooshi gathered the data. Farzad Gheshlaghi, Shafeajafar Zoofaghari, and Gholamali Dorooshi made data interpretation. Gholamali Dorooshi drafted the manuscript and all authors critically revised it for important intellectual content and approved the final version. Kikuchi S, Fujita Y, Onodera M, Fujino Y, Inoue Y. Prolonged hypotension induced by ingesting a topical minoxidil solution: Analysis of minoxidil and its metabolites. Acute Med Surg 2016;3:384-7. Katzung BG, Masters SB, Trevor AJ. Basic & Clinical Pharmacology. 12th ed. New York: McGraw-Hill Companies, Inc.; 2012. p. 181. Nagar R. Rabbit syndrome because of topical minoxidil foam. Dermatol Ther 2015;28:112-3. Dehghan Shahreza F. From oxidative stress to endothelial cell dysfunction. J Prev Epidemiol 2016;1:e04. Asadi-Samani M, Bahmani M. Trends on the treatment of atherosclerosis; new improvements. Angiol Persica Acta 2016;1:e01. Hasanvand A. Ischemia and post-injury regeneration in proximal convoluted tubule cells. Acta Persica Pathophysiol 2017;2:e01. Sinha A, Raheja H, Kupfer Y. Myocardial infarction after accidental minoxidil poisoning. Am J Ther 2018;25:e279-e281. Hanton G, Sobry C, Daguès N, Rochefort GY, Bonnet P, Eder V, et al. Cardiovascular toxicity of minoxidil in the marmoset. Toxicol Lett 2008;180:157-65. Brunton LL, Chabner BA, Knollmann BC. Goodman & Gilman's the Pharmacological Basis of Therapeutics. 12th ed. New York: McGraw-Hill Companies, Inc.; 2011. p. 781. Poff SW, Rose SR. Minoxidil overdose with ECG changes: Case report and review. J Emerg Med 1992;10:53-7. Aprahamian A, Escoda S, Patteau G, Merckx A, Chéron G. Minoxidil intoxication, the pharmacological agent of a hair lotion. Arch Pediatr 2011;18:1302-4. Garrard A, Wood A, Sollee D, Aaronson P. Refractory hypotension due to rogaine® (minoxidil) ingestion managed with midodrine. Clin Toxicol (Phila) 2011;49:907-9. McCormick MA, Forman MH, Manoguerra AS. Severe toxicity from ingestion of a topical minoxidil preparation. Am J Emerg Med 1989;7:419-21. Isles C, Mackay A, Barton PJ, Mitchell I. Accidental overdosage of minoxidil in a child. Lancet 1981;1:97. Sweetman SC. Martindale the Complete Drug Reference. 36th ed. London: Pharmaceutical Press; 2009. p. 1342. Allon M, Hall WD, Macon EJ. Prolonged hypotension after initial minoxidil dose. Arch Intern Med 1986;146:2075-6. Takahashi T, Takei T, Ito T, Sakamoto K, Nara T, Yagi K, et al. A case of minoxidil intoxication. Chudoku Kenkyu 2014;27:208-12.